Notes: Designed by Ralph Cutter, fishing guide out of Nevada City, CA. Ralph and Lisa Cutter are proprietors of California School of Flyfishing. You can visit their website at: www.flyline.com . Ants provide a steady meal for trout throughout the Sierras. Wind will blow them into streams and small ponds. Our Sierran Ants are generally a large size so using a size 12-14 is the most common. 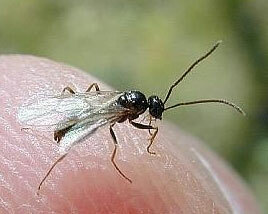 The most common period to use this fly in the Sierras is June through September. Ralph's pattern is particularly usefull in that it utilizes Antron fibers for the dubbed body. The Antron will trap air bubbles giving the fly a silvery sheen. 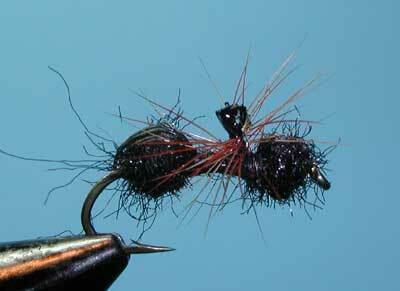 The use of deer hair provides a wingpost for the hackle but also provides additional floatation.